All about that Basil…or Whatever Herbs You’ve Got | Food It Yourself! Herbs are amazing to cook with. They flavor your food, encouraging you to add less salt. They can transform foods from one culture to another. Want that tomato soup to have a little Latino flair? Add some cilantro. French? Add marjoram, rosemary and thyme. Yes, those little green springs are pricy at the super market. They are often pricy even at the farmers’ market. But that’s why we DIYeter’s grow our own. 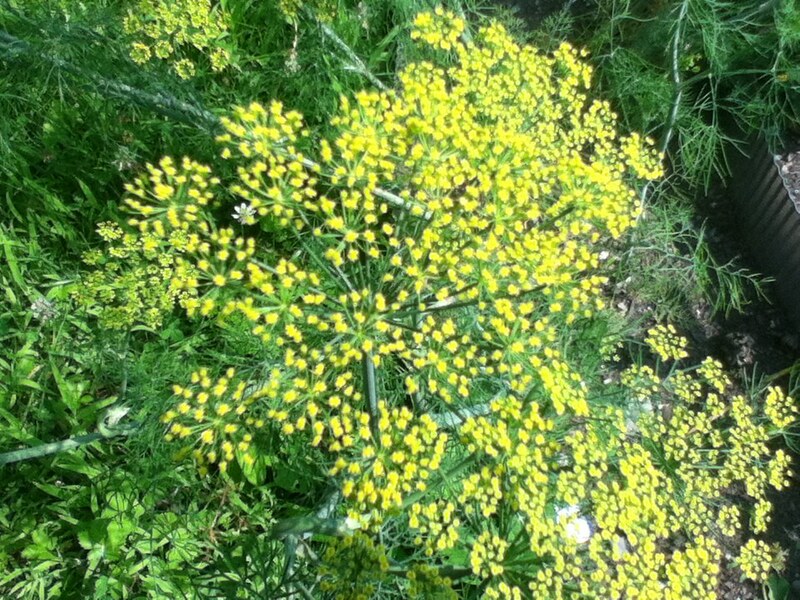 I might try harvesting seeds as well as leaves from my dill this year. I’ve never had dill bloom this well before! If you have not yet started growing herbs, here are some resources. Gardener’s Supply Company has a good page on herbs, both growing and preserving them. HGTV has a good primer, also. How Stuff Works has a detailed guide to starting an herb garden. If you live in an area with a shorter growing season, like I do, you may not be able to grow herbs outside most of the year. Furthermore, even a small plot or pot of herbs might produce more than you can use. How can a DIYeter preserve the deliciousness of home grown herbs? One way is to dry them. I’ll get back to that later; drying herbs requires a little planning and some special equipment to ensure optimal quality of your herb stockpile. Freezing herbs, however, is a great option since you probably already have a freezer. Here is how I froze my excess basil recently, although any herb can be processed this way. My basil was very leggy, so I pruned it back. It will come back fuller in a week or two. Recent rain storms had left the leaves so dirty I did the first rinse in my utility sink. 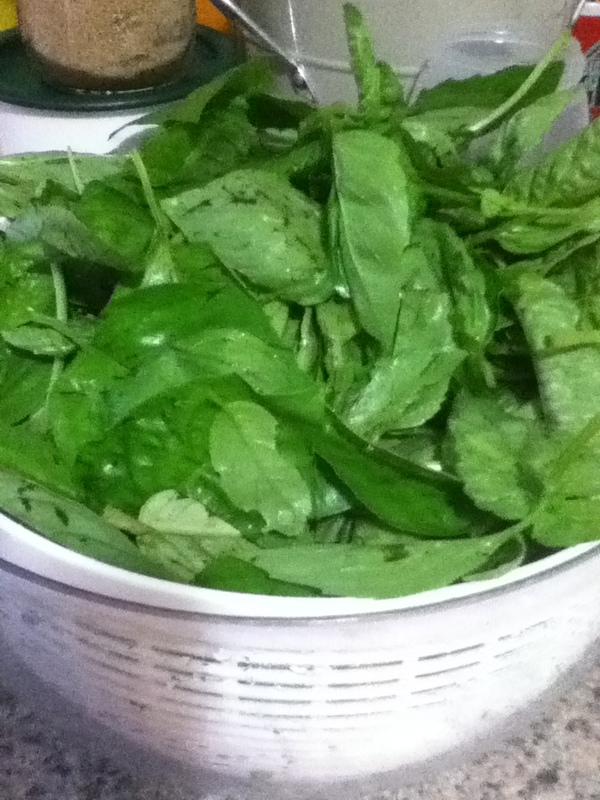 I picked all the leaves off the stems and gave them a second wash, then spun them dry. 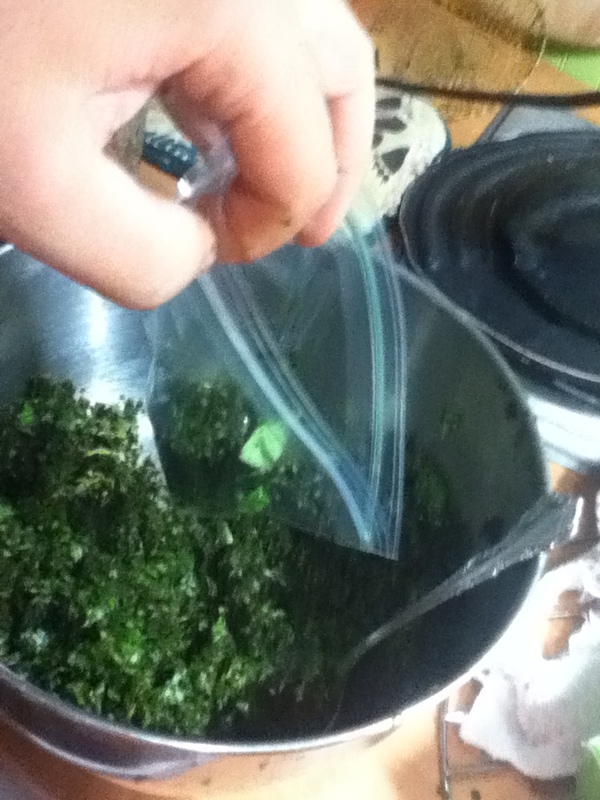 If you want, you can freeze whole leaves in zipper bags. I went a little further. 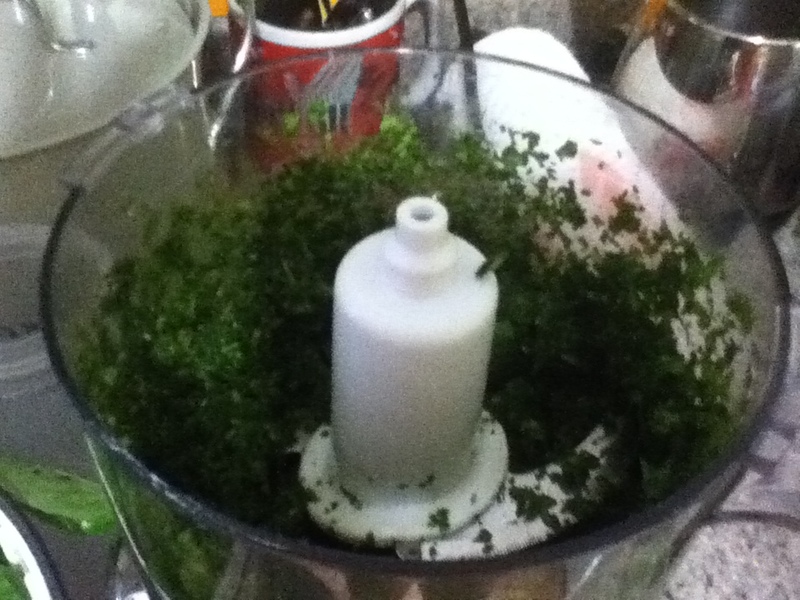 I ripped the leaves roughly and put them into my food processor. 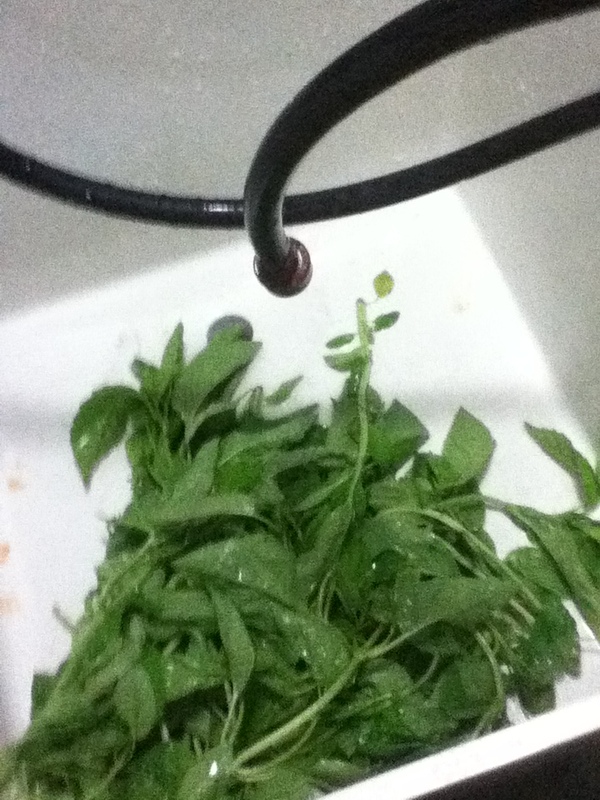 If you don’t have one you can chop herb leaves with a knife or smush them with a mortar and pestle. 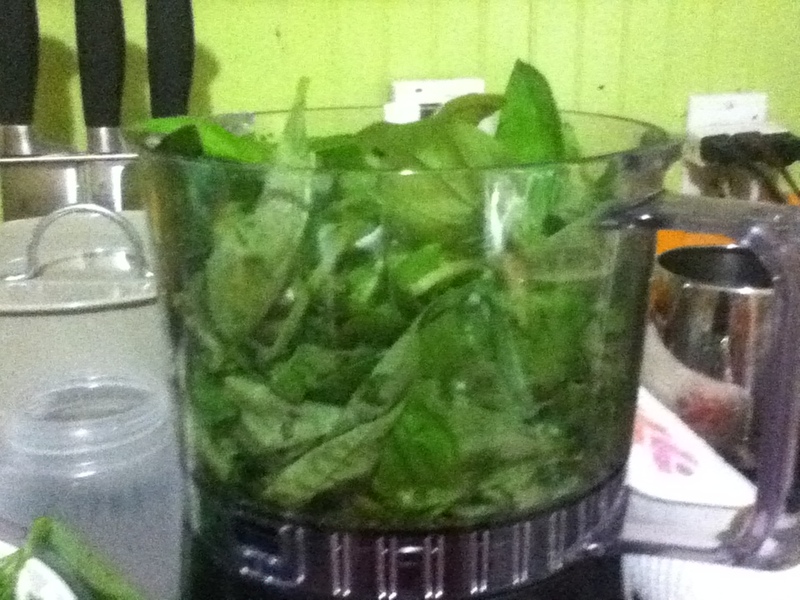 Here is the same amount of basil after processing. My food processor is tiny,so it took me multiple batches. I used the little “snack size” zipper bags and scooped a third to a half cup of chopped leaves into each one (I just eyeballed it, no need to dirty up a measuring cup). Squeeze the air out, seal, and pop them in the freezer. Probably a zillion other things, I welcome your suggestions. I hope you will try growing herbs. I hope you will save them for use later on. I hope you will use them frequently in your DIYet. Give them a try! Pingback: Wicked Mint! | Food It Yourself!